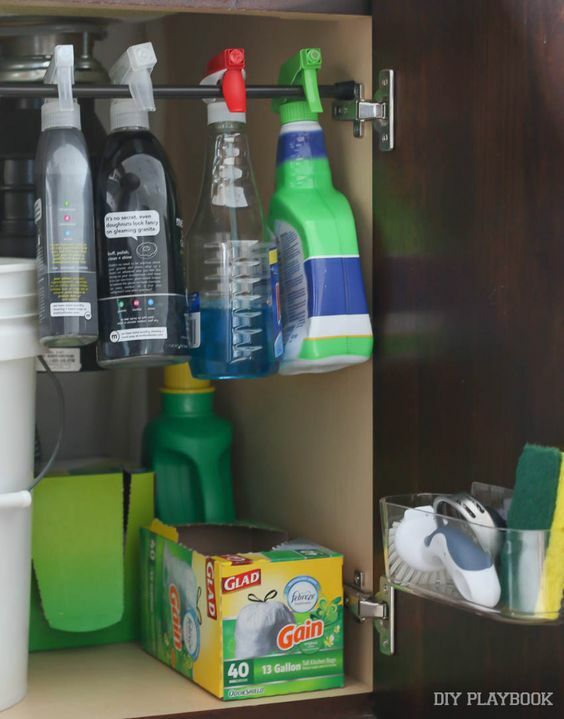 Planning to clean out under your kitchen sink? 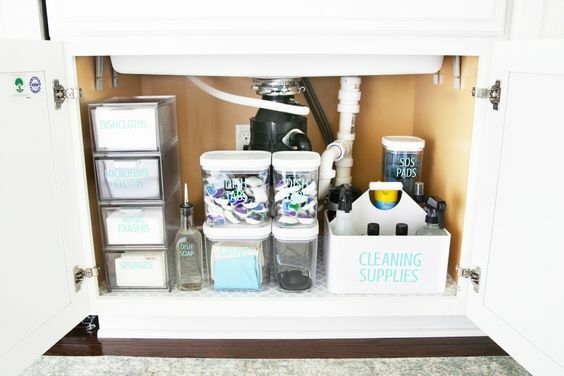 These brilliant under the sink organization ideas will help you plan the perfect way to organize it! I really don’t consider myself to be an organized person. While I love organized spaces, organization doesn’t come very naturally to me – I really have to work at it. I have two spaces in my home that are really truly organized (and stay that way pretty easily), and that’s because I put a LOT of time and effort into coming up with a system to organize the stuff in that space. Those spaces are my multi-purpose laundry closet and my family command center. It was a lot of work to get them where they are, but they WORK for our family and STAY organized…and that brings me a lot of joy! So, one of my goals this year is to go through a few more spaces in our home and work to get them functionally organized. 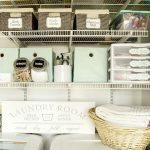 That’s a very different process than just cleaning them out – it’s working to organize in such a way that it will function the way I need it to work and stay organized without much (if any) extra effort. 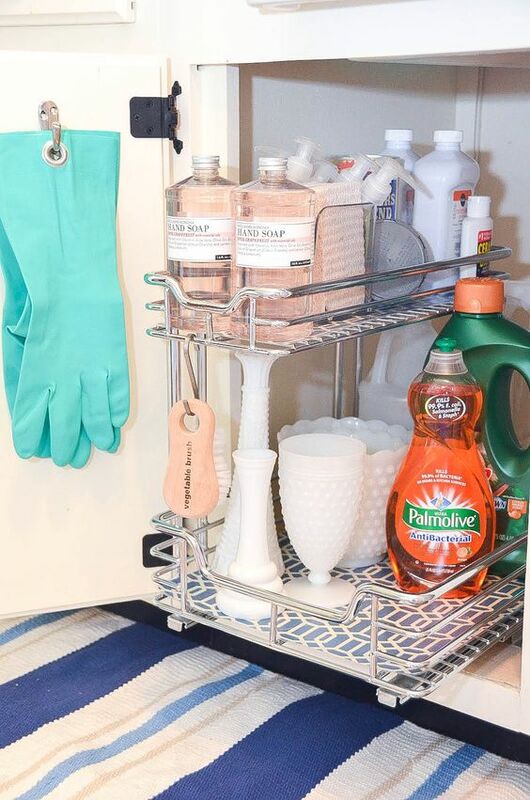 I’m starting small, and the first space on my list is under our kitchen sink! My husband got a new pull out trash can to put under there so everything will have to be pulled out to install that anyway. So I figured I might as well overhaul our under the sink organization system while I’m at it! 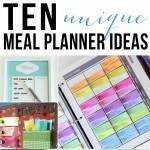 Before I tackle organization for a new space, I always scour Pinterest for ideas. 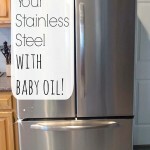 Why reinvent the wheel and start from scratch when lots of fabulous bloggers have already put their brilliant under-the-sink organization ideas out there? 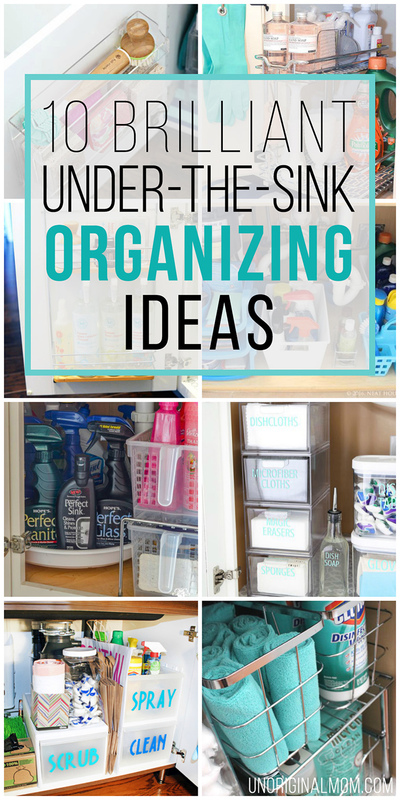 I’ve rounded up 10 really beautifully organized under sink spaces that contain some brilliant organizing ideas and hacks. If you’ve got this space on your “to-organize” list as well, I hope these are as inspiring for you as they have been for me! 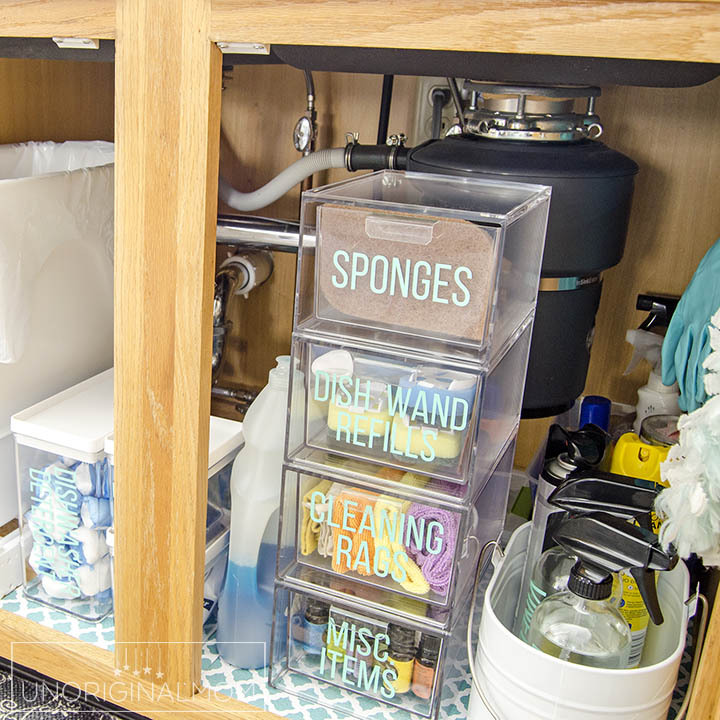 I’ll be back next week to share the “before” and “after” of our under the sink organization, so be sure to stop by again to see how I dealt with our space. 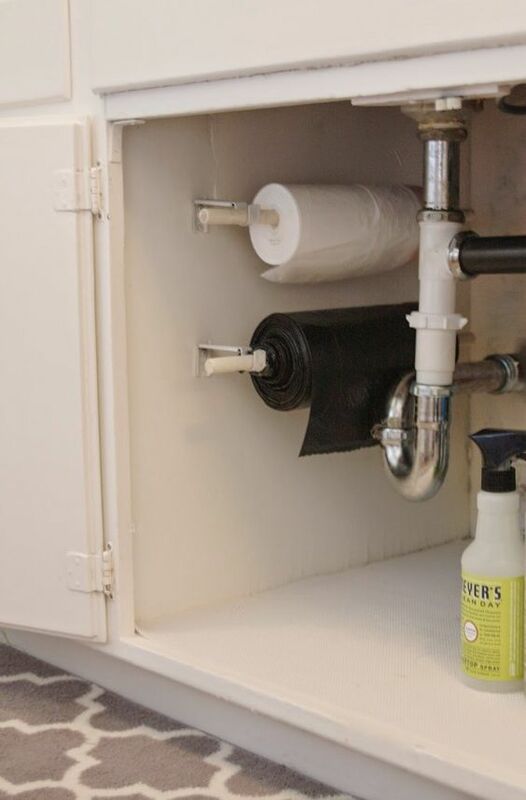 UPDATE: You can see our finished under-the-sink organization HERE!! Pinterest etiquette: Feel free to pin the collage graphic from this post, but if you’d like to pin and specific ideas please click through to each fabulous blogger’s post and pin from the original source! 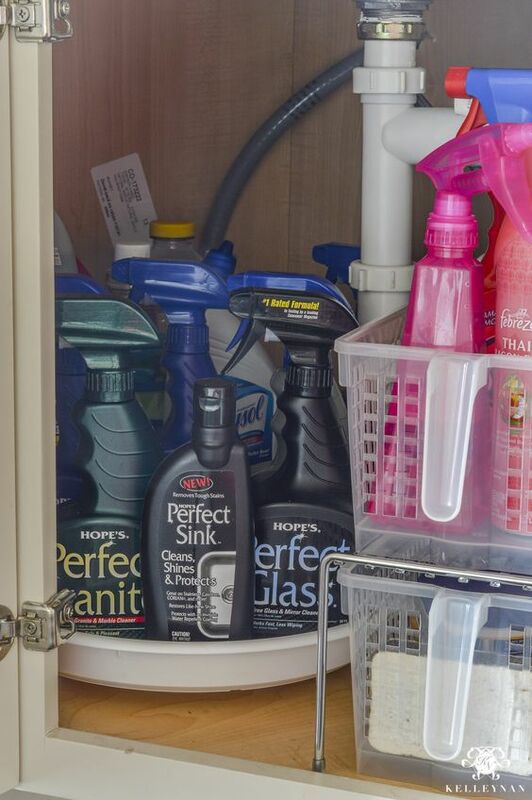 Angela over at Blue i Style has definitely maximized her under sink space! She’s got a lot of stuff down here but it all has a defined place. My favorite part is the labeled drawers! See her sources and full post here. 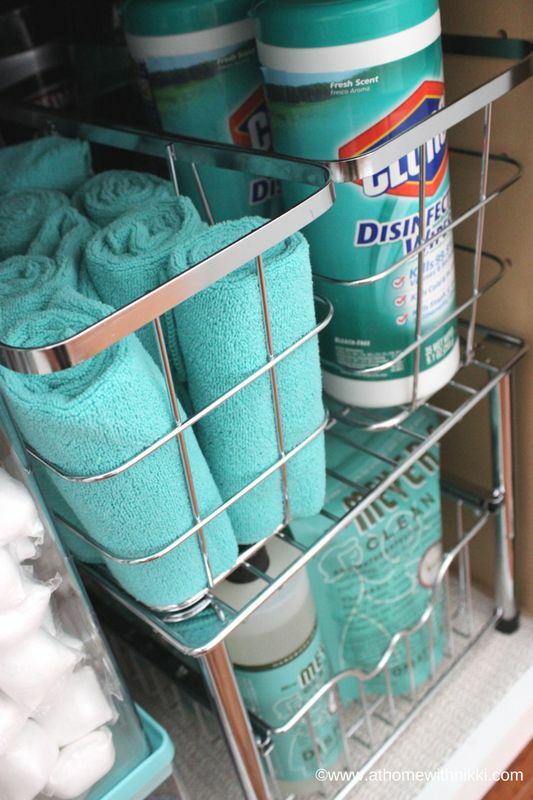 If you’ve got a few go-to cleaners in spray bottles, this is such a clever way to store them! See more at DIY Playbook. 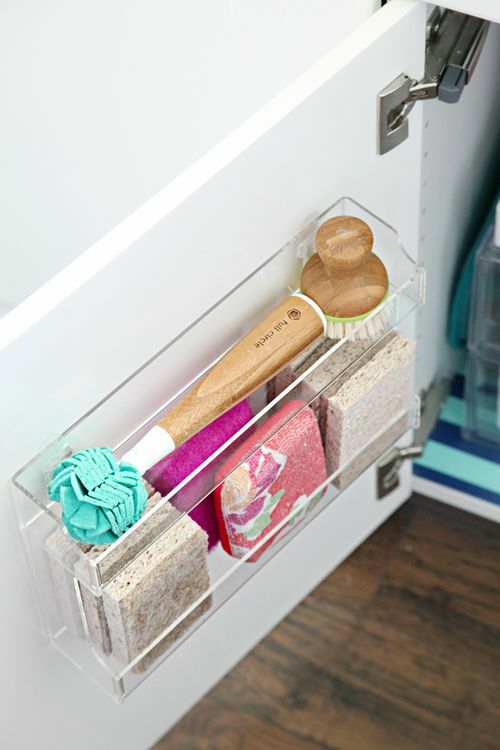 I love this clear acrylic caddy that Jen used on her cabinet door. Her entire cabinet is just beautiful – including wrapping paper on the bottom that she covered in contact paper! 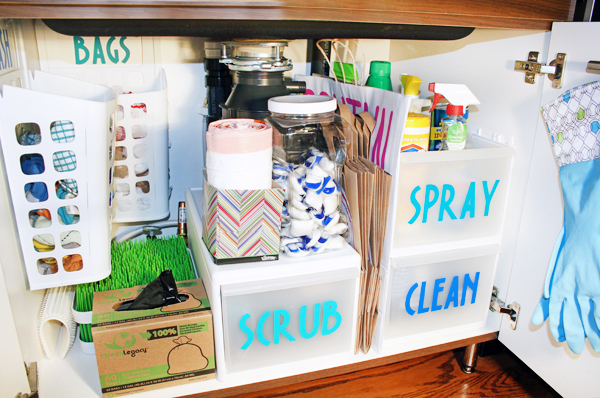 Click here to see it over on I Heart Organizing. 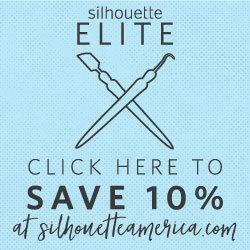 You don’t have to spend big bucks on expensive containers and organizers. 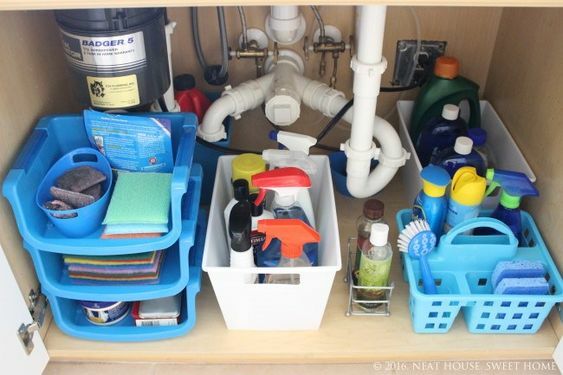 Neat House Sweet Home organized her entire under sink space with items from the dollar store! See more here. If you’ve got an odd shaped cabinet you can really maximize that corner space with a lazy susan, the way Kelley Nan did here! I really like this two tiered slide-out organizer – it’s a great way to maximize space around that gosh darn garbage disposal. See more at Iron and Twine. I love how pretty and color coordinated this space is from At Home With Nikki! Teal everything!! <3 Those wire baskets are great, too. See the whole space and a video tour here. This trash bag storage is really clever and so functional! 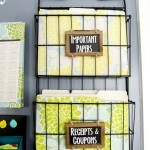 A great idea from Simply Organized. I love everything about this space from Abby over at Just a Girl and Her Blog. In fact, I think I’m going to use those same acrylic drawers in my cabinet! 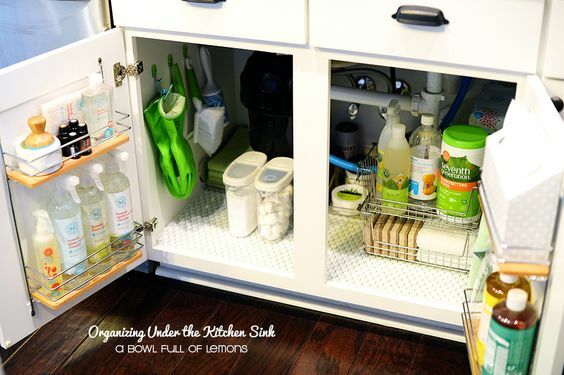 One last beautiful under the sink organization idea for you – this space is from A Bowl Full of Lemons. I especially like the organizers on the cabinet doors to really maximize the space!